A DataHand review I found on the net, mentions that the DataHand is unusable with just one hand. That’s absolutely true. Because the keys are grouped together per finger, you really have to use the correct finger positions to type at any speed. Using the wrong hand to press a key is totally cumbersome. I do have a one-handed keyboard. It’s called the FrogPad. It’s designed to be used with portable devices like PDAs and cell phones. You hold the device in one hand, and use the keyboard with the other. The FrogPad is small and very thin. It easily slides into its protective cover and your pocket. I have the USB version of the FrogPad, which I use with my Samsung Q1 UMPC. The Q1 has no keyboard other than an on-screen one. There’s also a Bluetooth FrogPad for devices without a USB port (or if you just can’t stand wires). The keys on the FrogPad are roughly the same size as those on a normal keyboard. The most common letters, at least for English, can be typed directly. The other half of the alphabet is formed by holding down the green modifier key while pressing the letter key. There are separate modes for symbols and for the numeric keypad. The FrogPad works great for typing in passwords, search queries, etc. It takes less than an hour to get the hang of it (i.e. typing while looking at the keys, without frustration). I don’t know how long it would take to become proficient at it (i.e. typing blindly at speed). I’ve never tried to use it for anything beyond quick newsgroup posts. But it’s certainly way more comfortable than the on-screen keyboard or handwriting recognition of the Windows XP Tablet PC Edition that the Q1 runs. If you often have one hand unavailable, for whatever reason, you could plug the FrogPad into your desktop PC’s USB port. Use your regular keyboard for two-hand typing, and the FrogPad for one-hand typing. 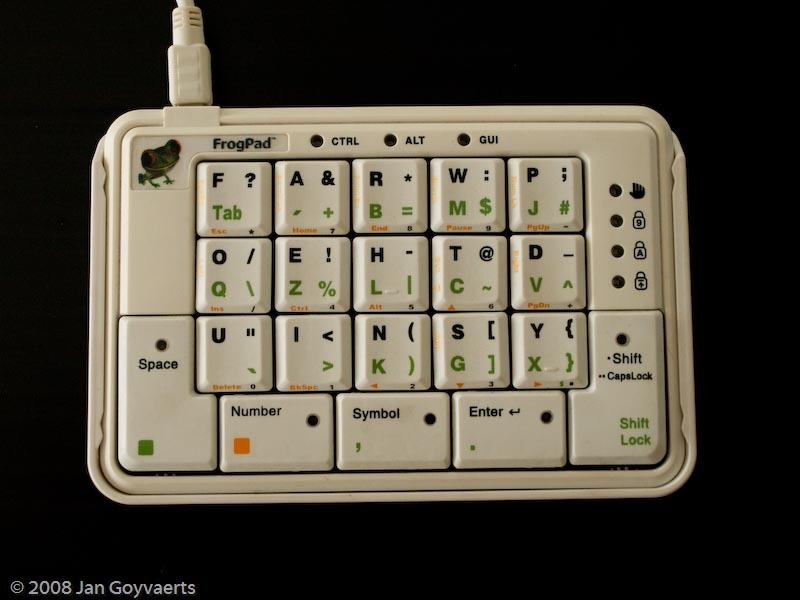 Typing on the FrogPad with one hand will be faster than typing on any two-handed keyboard, including an ordinary keyboard. A company in the UK called Maltron sells special single-handed keyboards. These have regular keys, like on a Cherry keyboard. There’s one key for each letter. Given the size and price (295 GBP) of the Maltron keyboard, keeping lying around one on your desk like you could do with a FrogPad is not really an option. But if you permanently have only one (free) hand, it does look like a worthwhile investment. One of the mouse replacements I tried during my blogging hiatus in 2006, is the Evoluent VerticalMouse 2. That was before I got the trackballs. Evoluent’s web site shows they’re at version 3 of this mouse. Judging the differences with version 2 as explained on the web site, I would expect to have the same overall experience with v3 as I did with v2. Since Evoluent didn’t bother to upgrade the left hand version, I’m sure they agree. 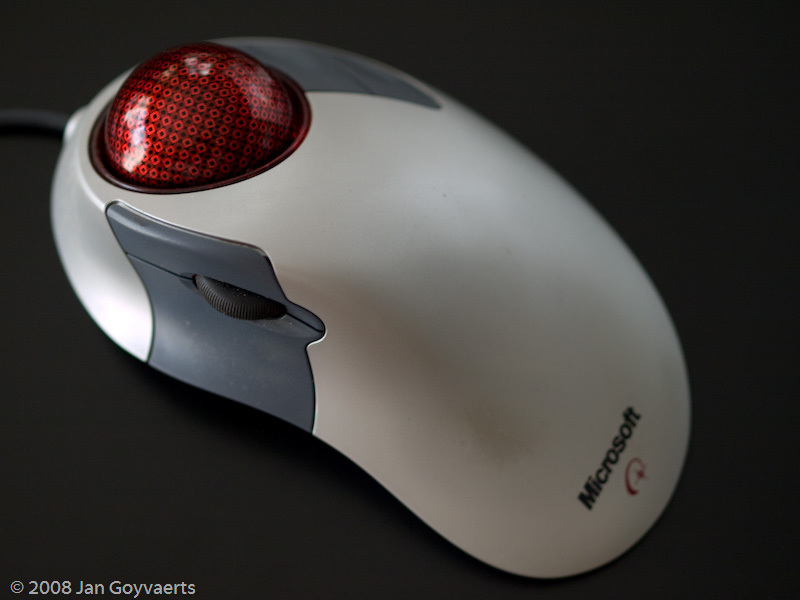 Essentially, the VerticalMouse is a regular optical mouse placed onto its side. Instead of laying your hand flat on top of the mouse, you hold it with your hand on its side, like you’d shake somebody’s hand. The claimed benefit is that this way your arm doesn’t get into a twist, and your wrist doesn’t have to bend as much. The VerticalMouse’s learning curve is about five minutes. Opening the box and plugging it in took longer than getting used to it. As a mouse, it’s simply excellent. The sensor is extermely precise. I had to turn down the sensitivity in the control panel, as I was used to a much slower mouse. The term “gamer grade” on Evoluent’s web site is no exaggeration. The handshake position does not make it any harder to move the mouse pricesely. Furious clicking can be a problem though. The force of your finger striking the mouse button can move the mouse if your grip isn’t tight. And tight gripping is not recommended ergonomically. This isn’t a problem for office or even graphics work, though. As a mouse, the VerticalMouse gets a perfect 10. Unfortunately, as an ergonomic mouse, it didn’t feel any better for me in the long run than a regular mouse. At the time I was feeling quite some discomfort in my wrists. That did subside when switching to the VerticalMouse. Though I had already purchased the DataHand, I still mostly used the Microsoft Natural Keyboard at the time. So the relief I got was mainly from switching the mouse. However, after using the VerticalMouse for several weeks, I started feeling discomfort in my right hand itself. When holding the VerticalMouse, my hand tended to rest on its side on the mouse pad, carrying the weight of my lower arm. In the long run, this gave me the feeling that the bones and tendons in my hand were being slightly crushed together. After that, I actually bought a new traditional mouse that had the same precision as the VerticalMouse. I alternated between the new mouse and the VerticalMouse for some time. When I began using the DataHand full time, I eventually stopped using the VerticalMouse in favor of the traditional mouse. I’m not at all convinced that input devices that require the palms of your hand to face the desk pose an ergonomic risk for the typical person. The DataHand and trackball I use now both require this position, yet I no longer feel any significant discomfort. With “significant” I mean waking up in the morning and feeling I worked too hard the previous day. What does have an ergonomic impact is keeping your wrist constantly bent. When your hands are flat at the keyboard or mouse, your lower arm needs to form a straight line with your hand. If you don’t, you’re putting stress on your wrists. And if the bent wrists rests on a surface, you risk pinching the nerves that go through the wrist. The book Itâ€™s Not Carpal Tunnel Syndrome I reviewed last year explains all that. By keeping my chair low enough, I can use the DataHand and trackball with straight wrists, giving me no discomfort. So while the VerticalMouse is an excellent optical mouse, I don’t feel it’s significantly more ergonomic. Unless you happen to have a particular medical issue that makes it hard for you to keep your arms extended horizontally while using a mouse. Then the VerticalMouse would be a solution. But you’d still need a vertical keyboard. Those exist, but not sold by Evoluent. Evoluent does sell a “mouse-friendly keyboard” which has the numeric keypad on the left. This allows you to place the mouse closer to the keyboard. At least when you use the mouse with your right hand. That is definitely a good idea. Keeping your arm extended to the right to hold the mouse for long periods of time puts unnecessary strain on your shoulder. This strain can cause discomfort not only in your shoulder, but also further down in your arm (as all the nerves go through your shoulder). The DataHand also allows the mouse to be placed close by (left or right). This certainly makes a significant difference for me. I’ve already written two articles about how I replaced my computer keyboard with a DataHand in response to early symtoms of RSI. But I haven’t blogged yet about what I did with the mouse, though I did show a picture in last year’s behind the scenes look. I actually tried several mouse replacements, including the one built into the DataHand. But in the end, I found that a trackball gave me the most comfort. I have two, actually. The one I use most of the time is the Microsoft Trackball Explorer. The actual trackball is very large. You control it with your index finger. The balls movement is very smooth and accurate. At the left side, there are the two standard left and right mouse buttons, with the usual button wheel between them. You control all three with the thumb. Essentially, you need only a thumb and index finger to operate this trackball. There are two extra “forward” and “back” buttons to the right of the ball. I never use those. The trackball’s weird shape fits the right hand very well. There’s no left hand version. The Trackball Explorer took about a week of getting used to. It’s instantly usable. But using the thumb for so many things feels weird at first, particularly as you never use it on a traditional mouse. Accurate control of the mouse pointer also takes some practice. In the end, for me the Trackball Explorer works just as well as a regular mouse for programming and office work. It also handles turn-based strategy games or point-and-click adventures well. But it’s not fast or accurate enough for any sort of real-time gaming. But then, if you have RSI, gaming is a no-no. The other trackball I have is the Microsoft Optical Trackball. This is a more traditionally styled trackball. You control the ball with your thumb. The left, wheel and right buttons are arranged like on a traditional mouse. This trackball works just as well as the Explorer version. Except that I find that using my middle finger to operate the scroll wheel feels far less comfortable after a long day’s work. I guess that the thumb and index fingers are somehow stronger, and better able to cope with the dual tasks of typing and mousing than the other three fingers. I mostly keep the Optical Trackball as a spare. Occasionally, my index finger gets tired of exploring the trackball all day. Then I switch to the other one for a few days. 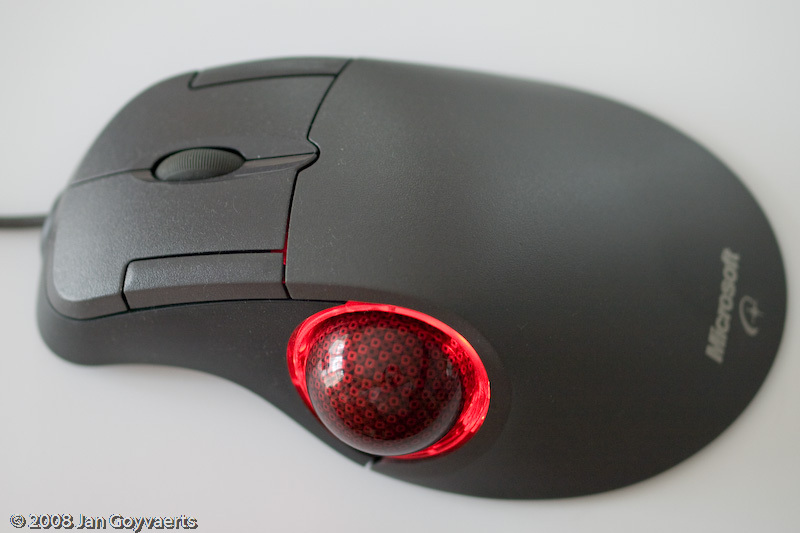 However, the main benefit of a trackball is that you no longer have to hold the mouse. I find that when using a traditional mouse, most of the discomfort stems from having to grasp the thing, no matter how hard I try to grasp it as lightly as I can. Unfortunately, the bad news is that Microsoft doesn’t make these things any more. That’s particularly weird because used ones easily sell for more than twice the new price on eBay. I did manage to get the Explorer brand new in box from eBay in 2006, and the other one NIB in 2007. If you’re planning to buy one used, make sure you get one that’s in perfect condition. Though both trackballs use optical sensors, they do have balls. Like old-style mice with balls, the bearings can get dirty, and then the ball won’t roll smoothly any more. I’ve looked around a bit, and found that Logitech still sells trackballs. The Trackman Wheel Optical is very similar to the Microsoft Optical Trackball. But the Marble Mouse Optical, which has a center-mounted ball, is quite different. It is symetrically shaped, to allow both left-hand and right-hand use. However, it doesn’t look like it will fit either hand nearly as well as the Microsoft Trackball Explorer fits the right hand. And what really kills it for me: there’s no wheel. I might still try one in the future though. P.S. : If the pictures seem a bit fuzzy, that’s because I’ve been playing with my new f/2 lens. With the focus on the top of the trackball, there’s not enough depth of field to keep the bottom in focus too. But I’m too lazy to redo them at a smaller aperture. Last August, I reviewed the DataHand alternative keyboard on my blog. My conclusion was that the DataHand is an excellent product that is let down by a very limited warranty. When paying $500 for a keyboard, I expect a full one-year warranty, not 90 days parts and labor. Datahand.com still advertises the same price and warranty today. However, my story with the DataHand didn’t end when I wrote the review, even though I had stopped using at that time. I’m writing this update on a brand new DataHand. At least, it was brand new last September. After writing the review, I let the folks at DataHand Inc. know about it. When writing a review, I feel it’s fair to give the reviewed an opportunity to respond. The DataHand people never did. A few days later I did plug in once more the unit that worked intermittently. And it worked again. I had observed in the past, and mentioned in my review, that leaving the unit unplugged for a few days would make the problem go away, usually for a couple of weeks or even a month. Two weeks later, with the one unit still working fine, I found a reply from DataHand in my gmail account. My bad for not checking that account more often. I used it because DataHand didn’t seem to be able receive email from my regular address. I was told that DataHand’s email issues had been fixed. This turned out to be true, making communication much smoother. Calling is a bit difficult with a 14-hour time difference. I was asked to explain the whole situation once more, which I did. I also said I was not interested in any further repair attempts. I depend on my keyboard, and it has to work 100%. I offered to send back the unit with the two permanently broken keys in return for a brand new DataHand. I would use the unit with the intermittent problem in the mean time, and keep it as a backup. I need only one DataHand, and I can understand that it’s hard for them to fix problems that even the customer can’t reproduce consistently. After a phone call from DataHand having me run some basic tests on both units, with no results, DataHand agreed to take back the broken unit and ship me a brand new one. So I shipped back one DataHand at my expense. One month later, the new unit arrived. It was shipped at DataHand’s expense, and came with a fresh 90-day limited warranty. It took so long because the DataHand was temporarily out of stock. This was advertised on their website. I had no problems with this, as the unit with the intermittent problem was working fine. It kept working perfectly until the new one arrived. Four months later, the new unit has continued working flawlessly. Hopefully it will continue to do so. The other two also worked perfectly for about five months. The one that I have left sits on the shelf. I guess I should box it before it collects too much dust. Update: It’s January 2009 now, and the new unit still works flawlessly. I even used the old unit with the intermittent problem for almost half a year. Details on my new blog. I still believe the DataHand folks could have saved both me and themselves quite a bit of trouble by offering a full one-year warranty. They obviously do try to help their customers. And I always felt that Lynn and Nancy, the two people I dealt with, are honest and try to do what they can within their company’s policies. When I inquired once again about the short warranty, I was told that they did offer a one-year warranty in the past, when the cheapest DataHand cost just under $1,000. When they cut the price in half, they also slashed the warranty. I still believe this is a bad business decision in the long term. Cutting the price in half surely raises sales. But even at $500, it’s still incredibly expensive if you compare it with a regular keyboard, and even most (so-called) ergonomic keyboards. In that light, I don’t believe that raising the price to $550 or $599 will have a dramatic impact on sales. And that would be more than enough to cover the cost of shipping out brand new units under a full one-year warranty. Imagine what I would have written in my review if instead of an expensive repair job, I’d have gotten a brand new replacement in no time. It comes up as result #6 in Google when I type “datahand review” in Google (#3 if I also type in the quotes). They’re obviously willing to take care of their customers. I wasn’t ignored, and in the end I did get a new unit. So why not make it a promise? Good customer service goes a long way. I often handle technical support requests from people who are using a trial version. Often, these questions arise more from the person’s unfamiliarity with the software that they could easily solve by looking at the help or even just all the available menu items, rather than an actual problem needing support. But such questions are usually quickly answered. When I do, the response is quite often that they’re surprised I replied at all–and a sale! Caring about customers isn’t a cost. It’s an investment. Business practices aside, I’m once again happily using my DataHand. I still feel that the product itself is excellent. Or rather: I don’t feel it. That’s the whole point. When I use the Microsoft Natural Keyboard for a few days, my wrists and arms are sore every day. I’m not really in pain, but it dampens my mood and productivity. The DataHand requires no effort at all. Yes, there’s quite a learning curve. But now it happens all automatically. Definitely worth $500 and the practice. Shame about the short warranty.